In Advent and Christmas this year, we are running our first Hymns and Carols series, beginning with Fr Jonathan Jong’s piece on O Come O Come Emmanuel, based on the ancient O Antiphons. Advent is my favourite liturgical season, and I think this is because it expresses something of the Christian life that resonates with my experience of it. Of course it is true that we are resurrection people, and therefore Easter says something fundamentally true about us. Of course we are people of the incarnation, and therefore Christmas gives voice to that aspect of our identity. But we are also people in waiting, but it is a funny kind of waiting. It is a bit like waiting for a meal, having already tasted it. Or it is a bit like a child waiting to grow into his new clothes. Or it’s a bit like waiting for your best friend to come home, because you’ve assembled people together to surprise him on his birthday. Or maybe it’s like none of these things, really, but they're as close as I’m able to get. In any case, it’s a waiting for something already come, and a waiting that is not merely passive, but demands preparation. Theologians often say that we live between the “now” and the “not yet”, which is another way of putting it. Anyway—perhaps because I am impatient by disposition, perhaps because feel like an adolescent in many ways—I know exactly what theologians mean by that; I feel it in my bones. That’s also what this hymn is about, which bids God come to be with us—Emmanuel, God with us—while looking back into and retelling the story of God’s being with us already: especially in the Davidic kingdom, in the Mosaic law, and in some versions of the hymn, in the creation of the world itself. The hymn draws its language almost exclusively from the Old Testament, in particular in the titles it invokes and related prophecies mostly drawn from the Book of Isaiah. Emmanuel itself is from Isaiah 7, in the famous prophecy about a young woman (sometimes translated virgin) giving birth to a son. The Branch of Jesse (or Root, in some versions) and Key of David also come from Isaiah, chapters 11 and 22 respectively. The Dayspring comes from Zechariah 3. You get the picture: the anticipation—the almost palpably impatience of the call “O come! O come!”—is founded upon long cultural and mythic memories. It pays to remind ourselves that these memories are not just the Church’s memories, but shared with our Jewish cousins, who are and have been the people of God long before there was anything recognisable as the Church. Without denying our differences, we can nevertheless hope together for the advent of our God, who remains ever faithful the promises made to Abraham and Moses and David, long before they were made to Mary and Peter and Paul. It is true that our response to the mystery of the Incarnation is ultimately an awed silence, in which our inadequate words are carried by the Holy Spirit’s own prayers on our behalf. But until then, the Christian thing has always been to speak profusely and imperfectly, offering up our wispy theologising like so much incense unto God. Now, speaking of speaking diversely, and having briefly earlier mentioned versions of the hymn, it is worth observing how difficult it is to find two recordings or even two hymnals that contain exactly the same words. This might be because the hymn was not originally written as such. Rather, it is an adaptation of a much older piece of liturgy, the O Antiphons, which dates at least as far back at the 8th century and may even predate the 6th. For centuries, the O Antiphons have been recited or sung as a frame around the Magnificat—the song of Mary from Luke 1.46-55— during Vespers (evening prayers) in the week running up to Christmas (Dec 17-23): the Magnificat itself too tells of God’s saving acts throughout the generations, culminating in the incarnation, and therefore are fittingly accompanied by these antiphons. It is difficult to say when the antiphons became a hymn, though the 12th century is often mentioned. The earliest version of the Latin lyrics only contain five of the seven antiphons, omitting O Sapientia (O Wisdom: Dec 17) and O Rex Gentium (O King of Nations: Dec 22); as far as we know, these were only adapted in the 19th century, probably in Germany. The history of the English translation of the hymn adds yet another dimension of complexity. J. M. Neale’s first translation was of the five-stanza version; it was not until 1916 that H. S. Coffin translated the final two. Neale’s is still the most influential of the translations, but others have since arisen. A comparison of the hymn across different hymnals and recordings is oddly satisfying, if tedious. My main observation from this enterprise is that very few recordings feature all seven stanzas; one is not even guaranteed to have the original five: true to the theme of diversity, the versions also often differ on which stanzas they do include, and in what order. 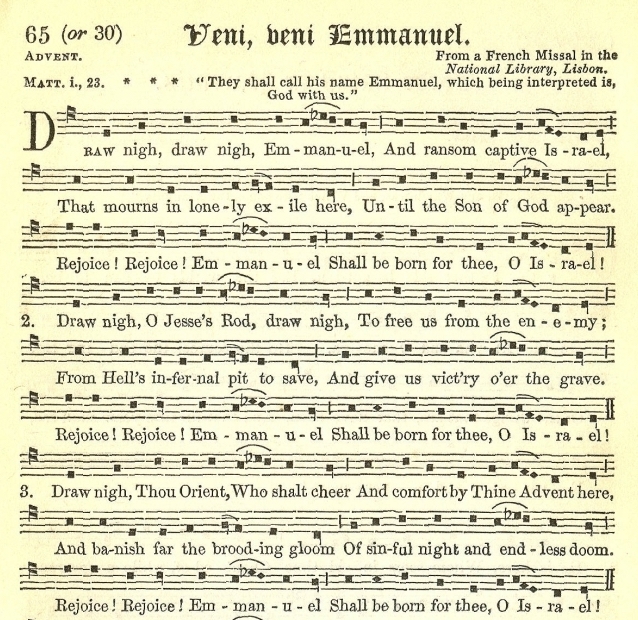 J. M. Neale’s 1851 translation, from the 1856 The Hymnal Noted. There’s some beauty in this chaos too; something about the incompleteness of our individual visions of salvation history, of God’s working in our lives and the world. I might sing some verses and leave others out, but you might sing the ones I omit, but together we turn toward Jesus and bid him come, who is already and ever with us, and our own song bears witness. Finally, a note on the version I have chosen to include here: it is a setting of the Lacey translation, which is my least favourite of the traditional English versions. But the musical setting captures best how the hymn makes me feel, what part of my faith Advent expresses perfectly: it is excited, almost impatient, even breathless, bordering on belligerent. J. Allen Cabaniss argues that Boethius alludes to O Sapientia in his Consolation of Philosophy, ca. 524. See his (1947) A Note on the Date of the Great Advent Antiphons, Speculum, 22(3), 440-442.